I need to discuss some very important things today. Like why do I keep trying to do pilates? Seriously, my core muscles are non-existent. But I need something to break up my Zumba and toning routines. And why aren’t more people wearing bunny ear headbands? I want to wear them everywhere. The mall, grocery store, going to the park, etc. Oh, and most importantly, Justin Timberlake is now sitting alongside David Tennant and Joseph Gordon-Levitt on my crush worthy list. I mean, I liked JT from his ‘NSYNC days. I liked when he wanted to Rock Your Body, brought SexyBack, and hosted SNL. So, anyone else have a crush on JT? In a large bowl, using a hand mixer, cream butter and sugar together for about 2 minutes. Add eggs and almond extract. Beat until combined. In a medium bowl, whisk together flour, baking powder, and salt. Slowly add dry ingredients to wet ingredients. Mix until combined. Fold in sour cream. Pour batter into lined cupcake tins and fill about ⅔ of the way full. Bake for 18-22 minutes or until a toothpick comes out clean. Make ganache. 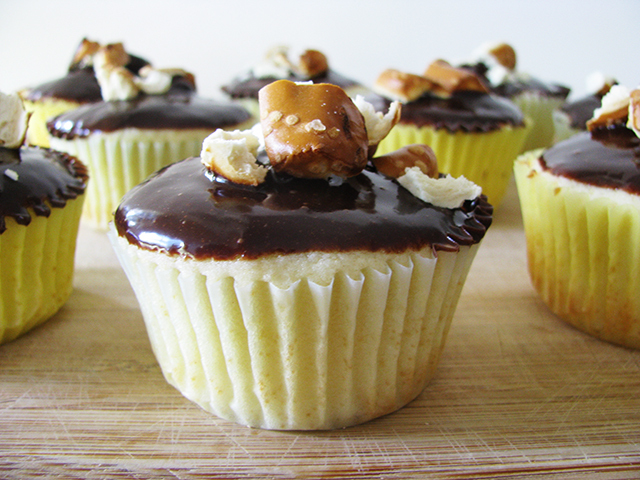 Dip the top of the cupcakes into ganache. Sprinkle with pretzel pieces. Place chocolate chips in a heatproof bowl. Heat heavy cream in a saucepan over medium high. When cream just comes to a bubble, pour over chocolate chips. Let sit for 4-5 minutes. This entry was posted in Baking, Food and Drink and tagged almond, crush, cupcakes, dark chocolate, David Tennant, ganache, Joseph Gordon Levitt, Justin Timberlake, pilates, recipe. Bookmark the permalink. Pretzel bits on top, awesome. I think JT is super hot, totally crushworthy.